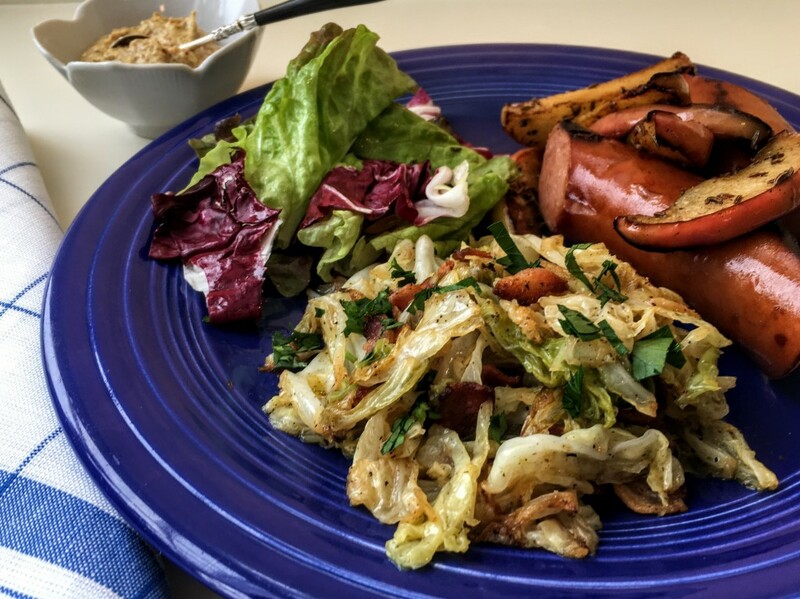 Grilled sausages served with pan-sautéed cabbage and bacon plus apple wedges sautéed in butter with caraway seeds is just the sort of no-fuss menu I love in this blustery weather. For the sausages choose a favorite cooked one (I always opt for kielbasa) and slice it into 3- to 4- inch lengths before grilling in a stove top grill pan or skillet until lightly charred. The two side dishes featured here, though, are the real stars of this meal. Each calls for only three primary ingredients and takes only minutes to prep and cook. Savoy cabbage, a mellow variety with crinkly dark and light green leaves, is quartered then sliced, and cooked in bacon drippings along with olive oil until lightly browned and tender. It takes about 20 minutes start to finish. While the cabbage simmers, you’ll need about 10 minutes or less to prep and pan fry the apple wedges in butter and season them with crushed caraway seeds. The sausages should only take 10 minutes of your time to grill as well! About 30 minutes for a home-cooked, hearty supper—definitely my kind of cooking on a cold, spring day! 1. Quarter the cabbage lengthwise and cut out and discard the tough inner cores and tough inner leaves. Also cut out and discard any tough thick veins. Slice each quarter, crosswise, into 1-inch wide strips. 2. Sauté bacon pieces in a large (11- to 12-inch) heavy skillet over medium heat until crisp, about 4-5 minutes. Remove with a slotted spoon to drain on paper towels. You will have 4 tablespoons (more or less) bacon drippings left in the skillet. Leave the drippings in the pan and add the olive oil. 3. Place skillet over medium heat until oil is very hot, but not smoking. Stir in cabbage strips, a large handful at a time, until all have been added. Sauté, stirring, until all the cabbage has wilted and some of the leaves begin to brown, 5 to 6 minutes. Reduce heat to low, cover and cook an additional 8 minutes or longer until the cabbage is lightly browned and tender. Remove lid every 3 minutes or so and stir cabbage to prevent burning, adding more oil if needed. 4. Remove lid, and stir in the bacon. Season mixture with fleur de sel and pepper to taste. Serves 4 to 5. 2 tbsp unsalted butter plus extra if needed. 1. Halve the apples (do not peel), then cut out and remove the cores. Cut each half into 1/2-inch thick wedges. 2. Heat the butter in a medium heavy skillet set over medium heat. When butter has melted and is hot (but not browning), add the apple wedges. Cook, turning very often with tongs until golden brown, about 5 minutes, adding extra butter if needed. The apples should be just tender when pierced with a sharp knife. Sprinkle the crushed caraway seeds over the apples and season lightly with salt to taste. Serves 4. Note: To crush the caraway seeds, place them in a self-sealing plastic sandwich bag and pound with a meat pounder or with a rolling pin until coarsely crushed. Crushing the seeds will make them more flavorful and very aromatic. This entry was posted in Food News and tagged apples, bacon, Caraway, quick, Savoy Cabbage, winter by brosbottom. Bookmark the permalink.